Everquest 2 – Ding 18! I’ve been adventuring in the Greater Fayedark since I started my character and I am happy to say that the content has subsisted through every level. At no point have I felt overwhelmed with the amount of things I needed to accomplish or disappointed by the lack of goals. This is one of the areas that EQ2 has definitely managed to get its hooks in me. I am still kind of aggravated by the interface’s lack of ability to allow me to track more than one quest at a time. I’m sure there is a UI mod out there for this, but I just haven’t managed to go out there and look for it. I’d really rather not “change” the game as much as experience it in the way it is being presented. Some of the lore and collection goals have been with me for 15 levels or more and its a nice bonus when I find the last item to complete those sets. So, in this aspect, maybe SOE has it right by encouraging me to stay focused on one objective at a time and to let the rest come as they may. 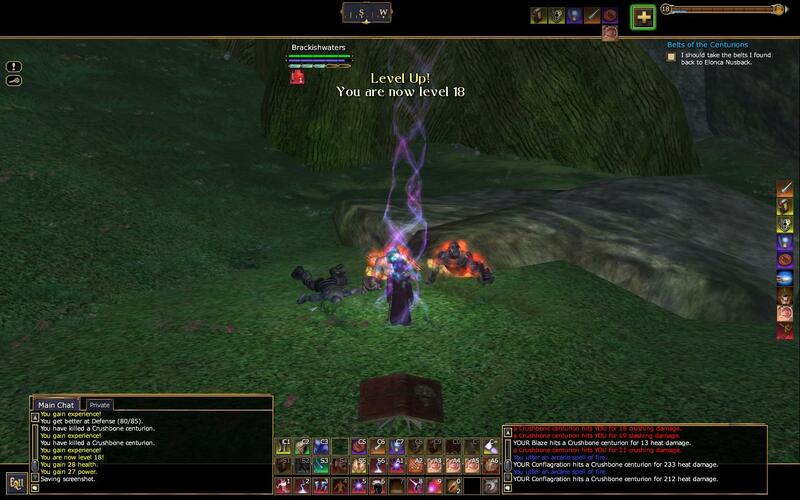 My initial goal of learning the lore of EQ2 has been moving along at a steady pace. One of the strangest things I ran into the other day was the /time command. The date, month, and year came back as nothing I had ever seen before. The year itself is numbered somewhere in the three-thousandths and the name of the month (if thats what it is) has no resemblance to that of any I have learned. I wish I had wrote down the information, as I would have liked to cross-check this against this excellent article over at The Athenaeum. I have a feeling this site will be very handy in the days ahead. The Crushbone Orcs have been a focal point for a majority of the lore so far. This is understandable as they have a major presence in the valley and seem to be the source of a lot of the area’s strife. I am slowly being funneled through a large cave in the back of one of their forward camps and into a more hostile encounter. I did see a keep or garrison at the end but I didn’t have the time to investigate more. The only other lore I have been able to find has been at the start of a chain of quests that began with a Dwarf near the broker in Kelethin. It looks to be an interesting line and I hope to detail my thoughts on it later as I progress further along the chain. I’m coming pretty close to the end of my trial and I can honestly say that SOE has done a good job with creating a game that can appeal to the adventuring and exploration aspirations of a traditional player. I am not quite sure how much it will cost me to continue playing as there is no way I will continue unless I have the EoF content. It is in these areas alone that I have found the best level of immersion and integration into the world for a new player such as myself. I can assure you, the ‘holy trinity’ has returned for their adventures in EQ2. Looking forward to taking on some killer content, as only we can. Keep up the interesting posts. Yeah, it’s great to have you two there with me now as there is no way I could do the quests alone we completed last night. I did manage to kill us only once last night with my curiosity, but hey we did get to find out why that tomb was clickable and what it was for. Well… kinda.